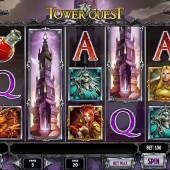 Fans of roleplaying board games such as Hero Quest and Dungeons and Dragons will be bouncing off the walls at the prospect of getting involved in mobile and online slots developer Play'n Go's Tower Quest release. 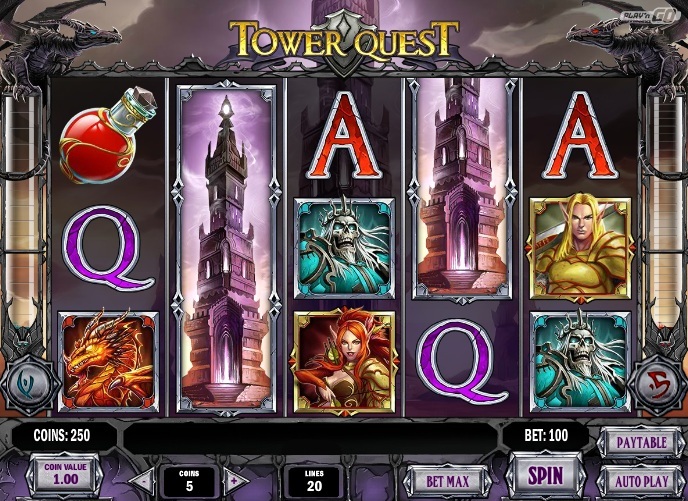 Tower Quest is a 5 reel, 20 payline slot that will take you back to your childhood when you were playing board games with the family during a reunion or festive meet up. In fact, Play'n Go are so keen to tap into the market of players that have had experience of playing fantasy roleplaying board games that they even went to the trouble of hiring the artist that provided the imagery for the iconic Magic: The Gathering board game. That kind of attention to detail can only be admired. The slot will immediately have you thinking of other fantasy-themed slots such as IGT's epic Dungeons and Dragons – Treasures of Icewind Dale and Microgaming's King Arthur-inspired release of Forsaken Kingdom – The Path of Valor. The big question is, can it exceed the standards of those two titles? Symbols on the reel include the male hero, female heroine, the nemesis, the dragon, the orc, and the regular Jack-through-to-Ace symbols. The Wild is represented by the expanding castle and this will substitute for all other symbols, except for the Bonus and Scatter symbols, to complete any potential winning combinations. You will notice that on either side of the reels there are two meters. The meter on the left is for collecting bottles of blue potion Scatters and the meter on the right is for collecting bottles of red potion Scatters. You can manually trigger different features depending on how many bottles of each potion you have collected in the respective meters. There are three potential features to trigger for each coloured potion. If you collect 5 bottles of blue potion then you can trigger the The Tower Free Spin. This is where you are rewarded with 1 free spin and the middle reel remains entirely Wild with a 2x multiplier added to any winnings hit on that spin. If you collect 10 bottles of blue potion then you can trigger the Battle of the Wilds Free Spin. For this feature, you are given 1 free spin. The five character symbols of the hero, heroine, nemesis, dragon, and orc are turned into Extra Wilds and these will substitute for all other symbols except the Bonus and Scatter symbols. If you are fortunate enough to collect 15 bottles of blue potion then you will trigger the Towers of Dark Power Free Spin. You will be awarded with 1 free spin with reels 1, 3, and 5 all turning completely Wild for that one spin. The bottles of red potion are harder to collect to trigger features but the features are more rewarding. You will need to collect 10 bottles of red potion to trigger the first feature which is the Empowered Wilds Free Spins. Here, you will win 5 free spins with any Wild wins triggered adding a 3x multiplier. You will require 20 bottles of red potion to trigger the next feature. This is the Wild Adventurers Free Spins where you receive 5 free spins with the hero and heroine symbols becoming Extra Wilds and substituting for all other symbols except for the Bonus and Scatters. Finally, if you collect 30 bottles of red potion you will trigger the Everburning Wilds Free Spins which sound as explosive as they actually are! You will initially be awarded with 5 free spins but on each spin a new Sticky Wild will appear on the reels. That is enough feature-filled chaos to create an action-packed slot on its own but that is not where the fun ends. If you hit three of the evil wizard Bonus symbols across the reels then you will trigger the main bonus feature on this slot. Once triggered, you will enter a card playing game against the evil wizard. The card attack and health values are compared to decide which cards win. You must win more cards than the evil wizard to win a prize up to 500x your bet. Tower Quest is one of those slots that you wait months for to come along. There are always slots that look good and receive the publicity hype to suggest they might be big hitters but few live up to the expectations. This slot is different. The features included on this slot during regular game play are enough to stir the excitement levels but the inclusion of a card playing bonus game is a stroke of total genius by Play'n Go. This is what I would call a game changer for the developer. If this slot is embraced as enthusiastically by roleplaying fans as it should be then this could propel Play'n Go to the next level. I do not over-exaggerate when I say that this is the most exciting slot I have played in years.